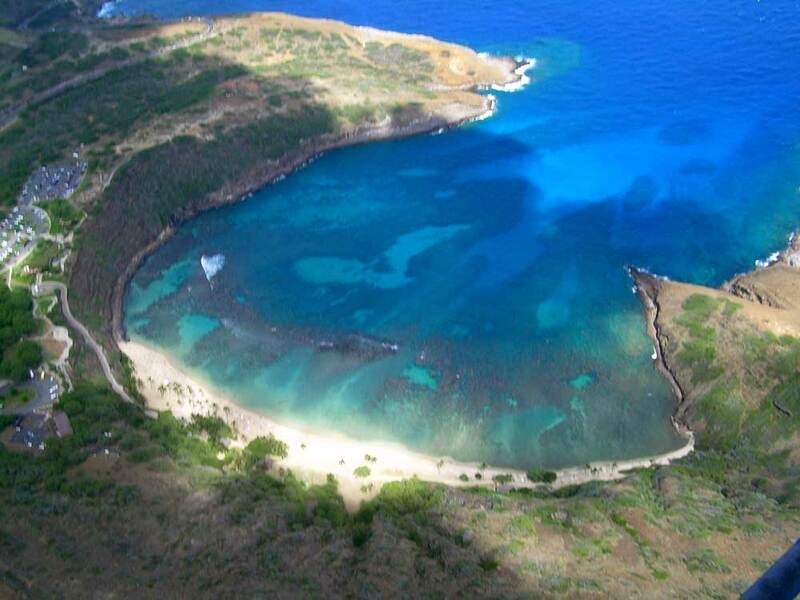 Hanauma Bay Marine Life Conservation District is east on H-1. The Freeway becomes 72, then follow your nose, eyes open. Many fish here, plus a snack bar & 2 shishoir. Open every day but Tuesday for clean-up. $7.50/admission, $1/parking. Waikiki Marine Life Conservation District is by the Aquarium. Easy access from Queen’s Beach but snorkel left toward the Natatorium. Sans Souci is just past Waikiki. Don’t turn left on Kapahulu–follow Kalakaua toward Diamond Head (east). Just past the Aquarium & Natatorium is Sans Souci beach. Very good snorkeling out to the left. Waikiki Beach is great for ogling, but the snorkeling is marginal; no coral & no rocks = no habitat. But it’s good bodyboarding. Beware surf students on big boards with no control. Ko Olina is an exit at the end of H-1 west. Tell the guardshack you’re going to the beach, & snorkel one of the 4 sheltered coves. Best & most fishy is Cove 1 at the Ihilani Hotel. Electric Beach (Kahe Pt.) is the 1st roadside beach on this coast. Past H-1 west to where it becomes Hwy 93, across from the old green power plant. Nice reef wall along the point. Papaoneone Beach is farther on 93 1/4 mile past the 7-11. Go left at Lahilahi St & park roadside by the condos––beach access is between them. The rocks on the left jut 75 yards. Snorkel inside for white sand, many fish & clear water. No lifeguard but many other swimmers and snorkelers. No facilities––LOOKOUT FOR BIG SURF! 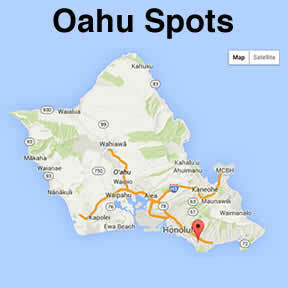 Makaha Beach Park is farther out 93. Lifeguards here, 9-5:30. I, SB head out 50 yards and turn right for thick fish traffic. Good for body boarding too, except when the surf is BIG! 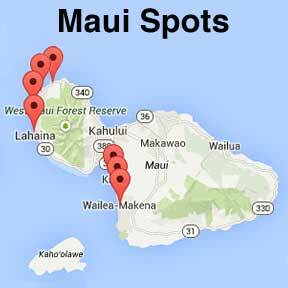 Makai Research Pier is 5.1 miles past Hanauma Bay going east on 72. Park and snorkel on the west side of the pier––ingress & egress from the beach. A LIVE reef here with plenty fish. Lanikai Beach is good for swimming & snorkeling, miles of great beach. Windsurfers here, so watch out. Beach access is between homes. 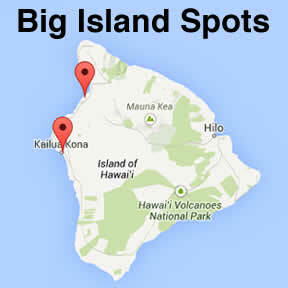 Malaekahana Bay State Park (Goat Island) is on 83, 24.1 miles past 63 going north. It’s a long beach with a reef & postcard pretty islet just off the beach that you may swim to. Turtle Bay is on 83, 30 miles past 63 going north. Turn right at Turtle Bay Resort & right again at the security shack. 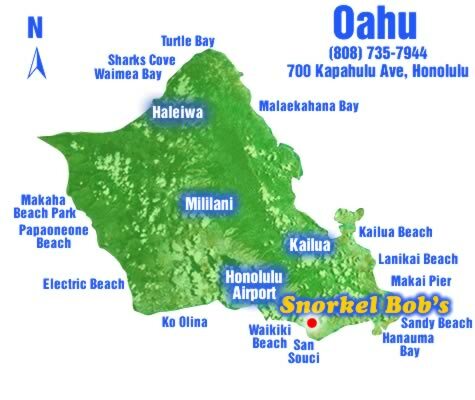 Shark’s Cove and 3 Tables are part of Pupukea Marine Life Conservation District in the heart of the North Shore––BEWARE October through April––KILLER SURF & CURRENTS. You can break your toe just sticking it in the water, it’s that rough, and I, Snorkel Bob, mean really. 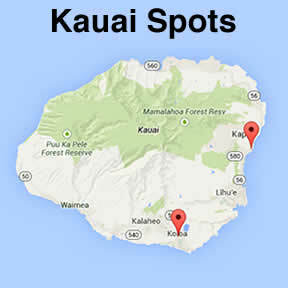 Dozens of other spots are known by your fellow snorkelers, whom you will meet on the great snorkel byway. Always ask about parking, surf, surge, current, visibility, fish life & safety.